Paul Leonard Newman (January 26, 1925 – September 26, 2008) was an American actor, film director, entrepreneur, humanitarian, and auto racing enthusiast. He won numerous awards, including an Academy Award for his performance in the 1986 Martin Scorsese film The Color of Money and eight other nominations three Golden Globe Awards, a BAFTA Award, a Screen Actors Guild Award, a Cannes Film Festival Award, an Emmy award, and many honorary awards. He also won several national championships as a driver in Sports Car Club of America road racing, and his race teams won several championships in open wheel IndyCar racing. Newman was a co-founder of Newman's Own, a food company from which Newman donated all post-tax profits and royalties to charity. As of October 2008, these donations had exceeded US $280 million. 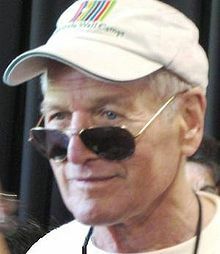 Newman was scheduled to make his professional stage directing debut with the Westport Country Playhouse's 2008 production of John Steinbeck's Of Mice and Men, but he stepped down on May 23, 2008, citing health issues. In June 2008 it was widely reported that Newman, a former chain smoker, had been diagnosed with lung cancer and was receiving treatment at Sloan-Kettering hospital in New York City. Photographs taken of Newman in May and June showed him looking gaunt. Writer A.E. Hotchner, who partnered with Newman to start the Newman's Own company in the 1980s, told the Associated Press that Newman told him about the disease about eighteen months prior to the interview. Newman's spokesman told the press that the star was "doing nicely," but neither confirmed nor denied that he had cancer. In August, after reportedly finishing chemotherapy, Newman told his family he wished to die at home. He died on September 26, 2008, aged 83, surrounded by his family and close friends. His remains were subsequently cremated after a private funeral service near his home in Westport.